Kamakura (snow hat) matsuri is celebrated in Yokote. Parents help their children build up huge snowdrifts and hollow them out into igloos. Then a small ceremonial altar is installed inside in the honour of the Shinto water god. A thick straw mat is put on the floor and candles are lit on the shelves carved into the walls. Children leave shoes outside and sit on the mat and wrap themselves in warm quilts. Neighbours and parents visit them to offer rice cakes, mandarin oranges (mikan), candies, tea, amazake (sweet sake), etc. Small rice cakes are warmed over a little charcoal stove. 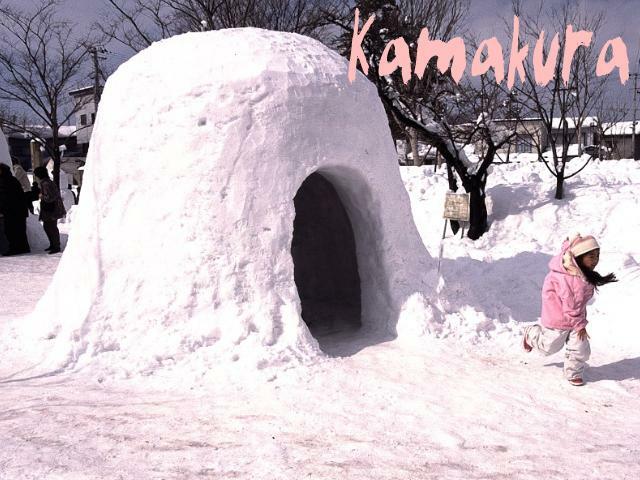 The children are sometimes allowed to stay overnight in their kamakura. Bonten matsuri is a bustling event. The bonden are about four-meter long poles serving as sacred wands of Shinto deities. They are symbols of masculinity. Local business associations and neighbourhood groups compete to create the grandest bonden. The decorations include characters from movies and television, Ebisu and Daikokuten (two of the seven gods of good fortune), and the current year's animal representative from the zodiac. At the Asahiokayama Shrine the bonden are presented to the deity as offerings.